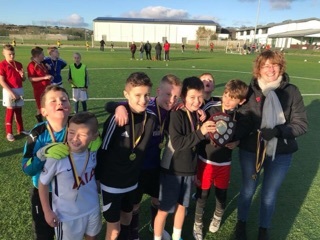 On Sunday the 5th of November the Brandane Bulls, with support from the Help Project, hosted a fantastic football tournament in memory of Calum Speirs, commemorating 10 years since Calum lost his battle to cancer at the age of 12. “Thank you so much to The Help Project and Brandane Bulls for organising today’s football tournament. There were over 90 players today split into 3 age groups. It was wonderful to see all the players out in the fresh air having good fun playing football. If you want the honest truth today felt quite hard. It was the 10th Anniversary Football Tournament, and I looked at lots of the wee faces and thought many of them hadn’t been born when we lost Calum, they didn’t know Calum. However by playing football in his memory today they were learning about him and the legacy he has left behind to help others who are suffering from cancer. Calum and Jenna loved nothing more than having our back garden full of friends and playing football. It certainly was a 5th of November to remember.